Professional swimmers compete in regional, national and international competitions to build on their athletic records. Swimming can be an expensive sport — competition fees, swimming gear, high-calorie diets and travel expenses add up, and time spent away from home makes it hard to maintain a full-time job. Because of these factors, competitive swimmers often seek sponsorship to help offset living expenses. 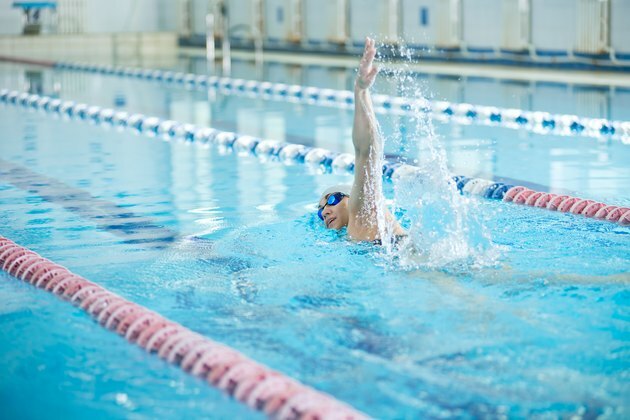 If you’re interested in becoming a pro swimmer, continue to refine your swimming skills while contacting local businesses for small sponsorships. As your reputation grows, larger sponsorships can help pay the bills. Spend time in the water. Swim lessons can help target weaknesses and optimize strengths. Joining a swim club or community swim team offers regular practice, supervised instruction and opportunities to compete against other athletes. Olympic-level swimmers generally train five hours a day for three days a week and then two to three hours daily for the remaining four days each week. Protect your body and mind. Maintain an athlete’s physique by eating right, including high-calorie meals to sustain your body through intense workouts. Physical therapy and personalized physical training can help you gain muscle strength and flexibility. Some pro swimmers train with sports psychologists in order to mentally prepare for key competitions. Enter the high school and then collegiate competition circuit by joining the swim team. Competing at the college level can establish your reputation as a swimming athlete within the National Collegiate Athletic Association. Although many pro swimmers get their start in high school and then college competitions, other athletes, such as Michael Andrew, age 14 in 2013, rely on early endorsement deals to fuel their success. Keep your eye on the clock. Swimmers must qualify with specific times in order to participate in high-profile competitions, including the Olympics. Honing your time until you are fast enough to compete will give you the opportunity to participate in more important events. Breaking records in your age group is an effective way to get media attention, create a name for yourself and help attract college recruiters and eventually sponsorship. Postpone the big dogs. Top swimming companies reserve their sponsorship dollars for established competitors, according to "Swimming World" magazine. Until you’ve proven yourself, conserve your energy and only approach small to mid-size swim companies for professional sponsorship. Local sports stores or swimming facilities might send gear your way or offer to help pay for competition fees, for example. Represent these companies with friendliness and professionalism, always expressing gratitude for what they can offer. Graciousness, combined with proven athletic ability, can help you score larger sponsorships down the line. Consider approaching businesses not strictly related to swimming, including nutrition, fitness and apparel companies. Keep in mind, though, that getting paid for endorsements means giving up your amateur status and forgoing college competitions. Slate: Why Do Swimmers Peak So Young?